Versatility and portability are key benefits of the Keeler PSL one and PSL Classic Slit Lamps. Keeler designed and manufactured with the strength to withstand the daily traumas of the demanding ophthalmic environment, the PSL is lightweight, durable and robust. Top quality multi-layered glass is crafted into our Keeler multi-element and multi-layer coated optical system to give maximum performance. Clarity is guaranteed. Proven halogen illumination system. Illumination levels are controlled by a rheostat giving you control of your examination parameters. From zero to maximum, you choose. 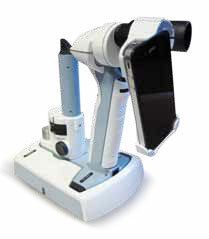 Unique features such as the fixation targets, and the 1mm square light patch for assessing anterior chamber flare set the new standard for Portable Slit Lamps.